Sunny to partly cloudy. High 71F. Winds W at 15 to 25 mph. Higher wind gusts possible..
A clear sky. Low 43F. Winds SW at 10 to 20 mph. A 2017 mug shot of Jacob Coomer. BOISE — A man being escorted to Twin Falls County ran away from sheriff’s deputies while they were leaving the Boise Airport Thursday afternoon. Jacob T. Coomer, 29, of Southside, Tenn., was wanted on a warrant related to drug charges. The Twin Falls County Sheriff’s Office had sent two detention deputies to Missouri to pick him up, spokeswoman Lori Stewart said. The deputies flew with Coomer to the Boise Airport. The incident occurred just before 5 p.m. Thursday. Coomer was handcuffed when he got away, Stewart said. As of 6 p.m. Thursday, he was in custody and still en route to the Twin Falls County Jail. Additional charges related to his attempted escape are pending. 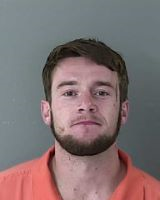 Coomer was wanted in Twin Falls County for a felony probation violation on possession of methamphetamine, Stewart said. He was being held in Jefferson County, Mo. According to a tweet by the Boise Police Department, he was taken into custody near West Airport Way and West Wright Street in Boise. No one was injured. This afternoon two Twin Falls County Deputies were transporting a suspect to Twin Falls through the Boise Airport when the suspect was able to get away from the deputies near the parking lot. BPD was called to assist and the suspect was taken into custody a short time later. The suspect was taken into custody near W Airport Way & W Wright St. There were no injuries. The suspect is being taken to Twin Falls where he will be booked into jail. Additional charges are pending. Obviously not the sharpest knife in the drawer. We spent money on two Sheriff’s deputies to fly to MO to retrieve this man!? How much did this cost? How much did the TFSD just spend including per-diem as well as other expenses, to get this one man who had a warrant for possession of meth? Did the man detainee by the TFSD have like a million dollars worth of meth, or use a weapon to threaten, hurt, or kill a person when initially arrested? How can the TFSD justify spending tax payer money to extradite this individual especially if the crime was for the possession of a small quantity of drugs? This man is a not a notorious drug cartel leader, so why use this counties finite resources?